Believe it or not, it’s almost summer! It’s weird, because some people had snow just last month, but next month is actually June! That means it’s time to scrub off dead skin and get your skin glowing and summer ready! But you don’t need to scrape your skin with a loofah. 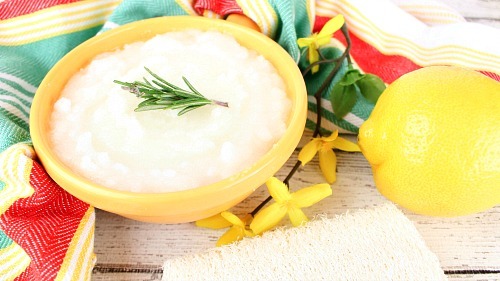 Instead, just use this effective and moisturizing DIY Lemon and Rosemary Sugar Scrub! Plus, it smells great! 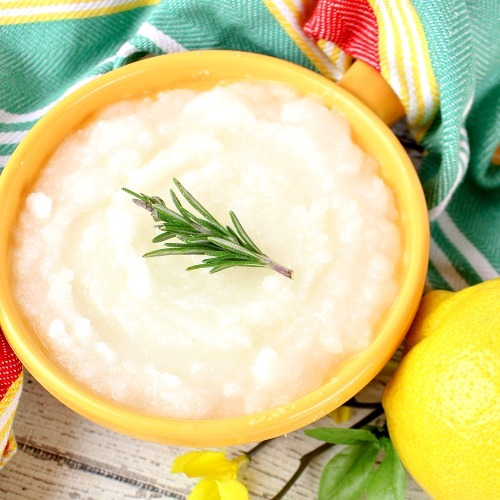 Since this DIY sugar scrub includes lemon essential oil, you will want to be careful about using it before going outside. That’s because lemon essential oil can cause photosensitivity, meaning you can have a reaction (like a rash or sunburn) if you go out in the sun too soon after applying the scrub. To be safe, make sure to rinse the scrub off completely. Also wait at least 6 hours before going out in the sun. 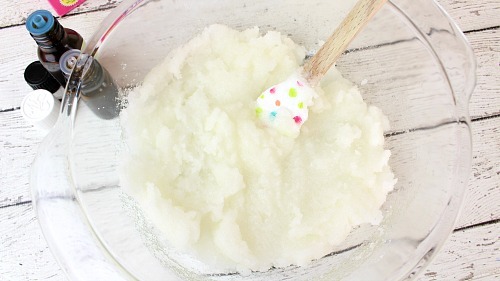 To be safe, I like to use homemade sugar scrubs like this at night before going to bed. That way it’s over 8 hours before I’m outside again. And of course, always use sunscreen. 1. Place all of the ingredients into a medium bowl and mix well to incorporate. 2. Transfer to an airtight container and store in a cool, dry place for up to 1 month. 1. 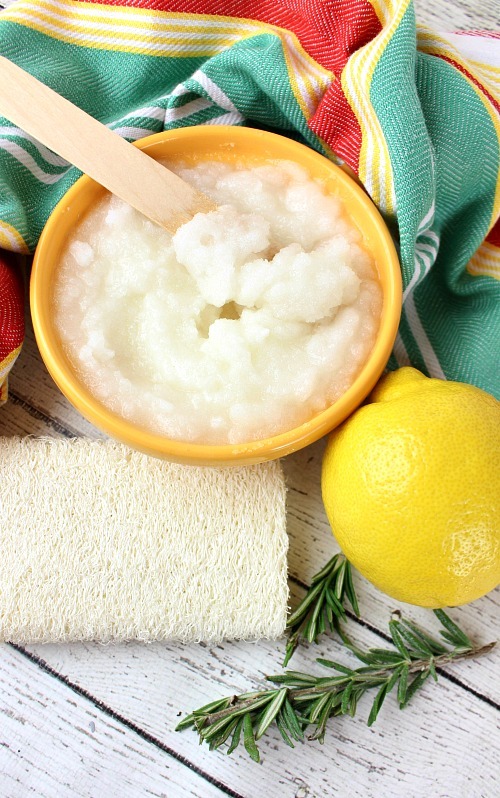 Wet skin and apply the lemon and rosemary sugar scrub generously to skin. If you’re putting it on your face, be gentle, and avoid your eyes. 2. Massage in a circular fashion to allow the sugar to exfoliate and the coconut oil to moisturize. Enjoy the crisp, clean, and uplifting aromas of lemon and rosemary! 3. Rinse with water and gently pat dry with a towel. 4. Apply your favorite skin moisturizer. I like to use my DIY vanilla whipped body butter. Vitamin E oil is wonderful for skin! It gives your skin nutrients it needs, fights the free radicals that lead to aging, and is great at moisturizing. Lemon essential oil is astringent, contains antioxidants, plus contains other helpful things. What this means is that lemon essential oil helps clean your skin, makes it less oily, fights free radicals, and can even reduce the chance of an acne outbreak! Rosemary essential oil is antiseptic and antimicrobial. So like lemon essential oil, it cleans your skin, helps make your skin less oily, and fights acne. So overall, this lemon and rosemary sugar scrub is really beneficial! If you like to make your own sugar scrubs to give as gifts or use yourself, then you’ll love our DIY Sugar Scrubs eBook! 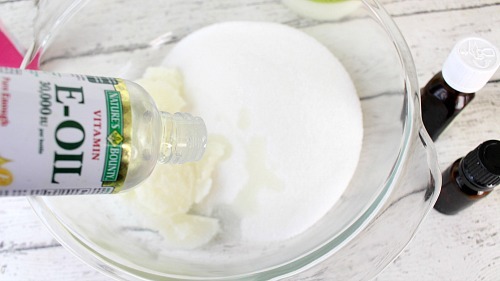 How many DIY sugar scrubs have you made? Do you give any as gifts?